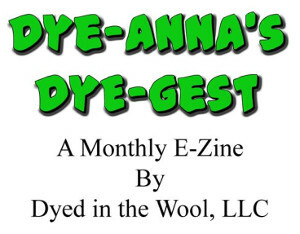 The Online Guild's Vegetable Dyeing Challenge offered several options, including things like doing comparisons, or working with fibers and/or dyes new to you. Both the cotton and the Procion MX dyes are definitely new to me, so they are a good choice for me to work with. Cotton lint is actually ginned cotton, i.e. the seeds have been removed. However, it still contains bits of husk and bits of stems. And even though it looks and feels clean, it is not. The directions that came in my dyeing kit (which can be found here), did not include instructions for washing the fiber, so I used the instructions given in the challenge notes. These called for 1/4 teaspoon of washing soda (also known as soda ash or sodium carbonate) and 1/4 teaspoon of Synthrapol per gallon of water. Since I don't have any Synthrapol, I used my old standby, Dawn dishwashing detergent. I weighted out 8 ounces (228 grams) of cotton and put it into my dedicated dye pot along with four gallons of water. That meant I needed one teaspoon each of washing soda and Dawn. After it had simmered for about an hour, it looked like this. Even though the cotton hadn't looked dirty, the color of the wash water tells a different story. After rinsing, I divided it into four plastic bags to await color. That will give me roughly two ounces of fiber per color. When I want to do more, I'll wash some more cotton. How much of a difference did the washing make? Well, can you tell which side was washed and which one wasn't? The best part of doing this in my little dye "studio" was being able to keep the heat and humidity outside! WOW! Look at how snowy and white the washed cotton looks. I would have never guessed that it was that dirty to start with. It will be so fun to see the progression -- although I will be behind the curve, as we're leaving tomorrow morning for a 2 week trip through Texas. Have fun, fun, FUN! What a great challenge! What an excellent idea that color chart is! I love it! Have a good trip, Jane. Wow, I would have never thought that the white cotton was so dirty. I love the pic of the two what a difference, the right one has a white greyish hue, while the other has a white yellowish hue, at least on my pc screen they look like that. I can't wait to see the next step, this is really interesting since I allergic to animal fiber I never thought about cotton, so there may be hope for me yet with spinning and dyeing. How interesting! thanks for sharing, Leigh! Fun Leigh! I've never worked with cotton before. And what a great "dyeing studio" I love it! this is so exciting to watch! thank you for taking such great pictures so we can enjoy the adventure with you. I am looking forward to the next installment of your cotton dyeing adventure! I am always amazed at the difference after scouring. And from personal experience, it does make such a big difference in the take up of the dye. Thank you all for the encouragements. And Patrick, thank you for that personal observation. Every little bit of information helps! Hey nice information but you have not mentioned the temperature and time required for this treatment. Generally with caustic scouring it takes about 1h and at boil, i guess.